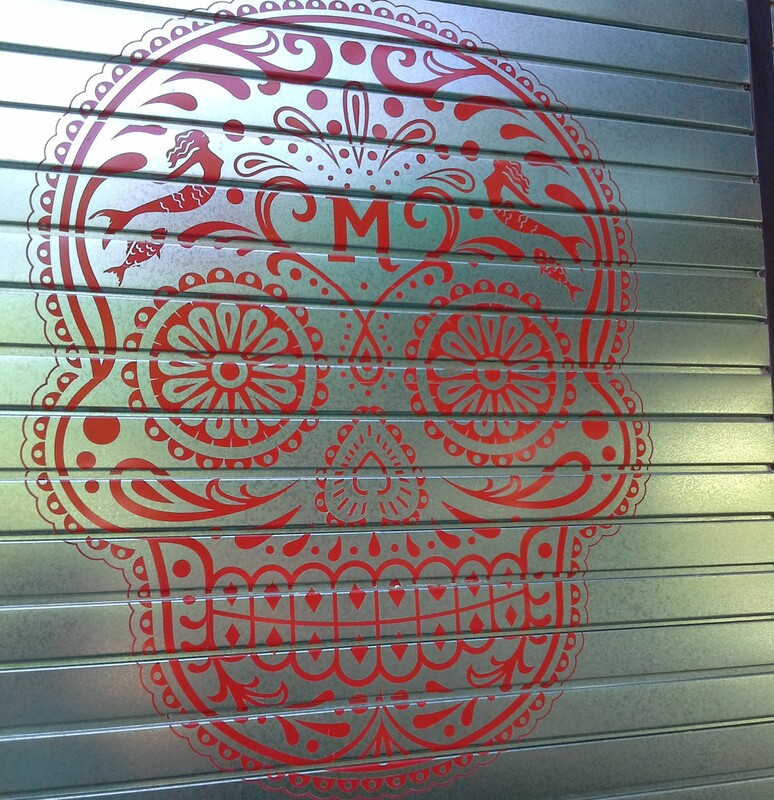 Mexico has a special relationship with the dead that we northerners can find disconcerting. We understand Halloween and all that goes with it, including skeleton costumes, excess candy and scary cemeteries. We don’t always understand how families in Mexico can celebrate Day of the Dead at cemetery graves decorated with candles and marigold flowers, and favorite food and drink of the deceased enjoyed by all, including the departed. Children run around and play among the gravestones, while their parents and grandparents share special dishes, laugh and chat. One may see images of La Catrina, the elegantly attired female skeleton who laughs at death, and sugar candy skulls decorate the alters. At this time of year, death seems front and center, not tucked away behind social mores. 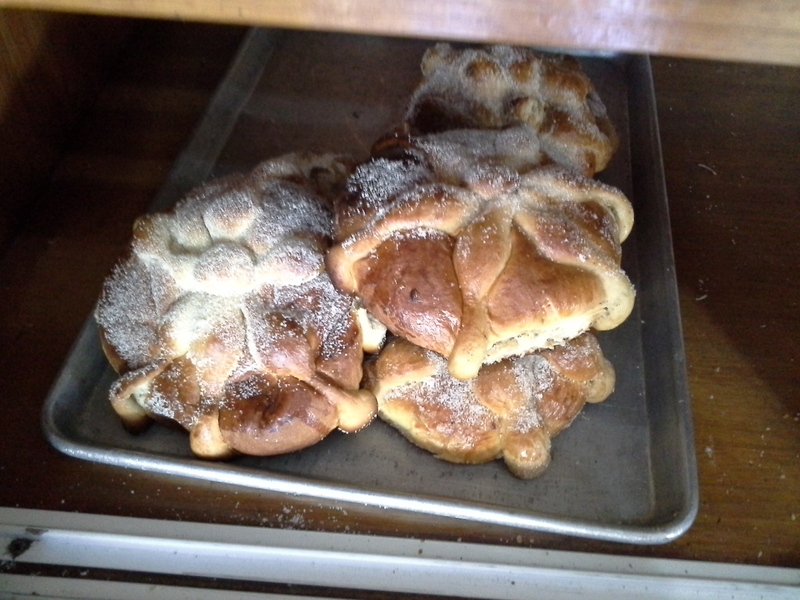 Pan de Muerto, or Bread of the Dead, is the most iconic food for Días de los Muertos. This lightly sweet, rich bread, similar to brioche, can trace its origins to Spanish bakers who immigrated to Mexico in the last century. This makes sense, given that Mexico does not have its own tradition of baking, but rather adopted desserts and recipes brought to the New World by Spanish nuns and later by immigrants. In the few weeks leading up to Day of the Dead, Pan de Muerto is in all the panaderías and grocery store bakeries, even at Costco, where they were handing out generous slices the other day. I won’t go so far as to say we can make a lunch of Costco’s samples, but Russell and I can come pretty close, and Pan de Muerto made a perfect dessert after other bits and bites were sampled last week. 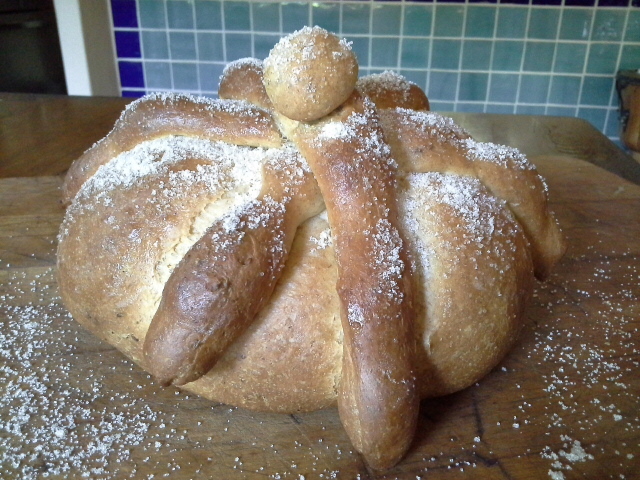 Orange blossom water and anise seed are the two signature flavors of Pan de Muerto. Surprisingly, I found a bottle of orange blossom water on my shelf, purchased on a trip to the U.S. for a now forgotten recipe. This distillation is made from the blossoms of bitter orange, and has a strong floral aroma that mellows as it bakes. 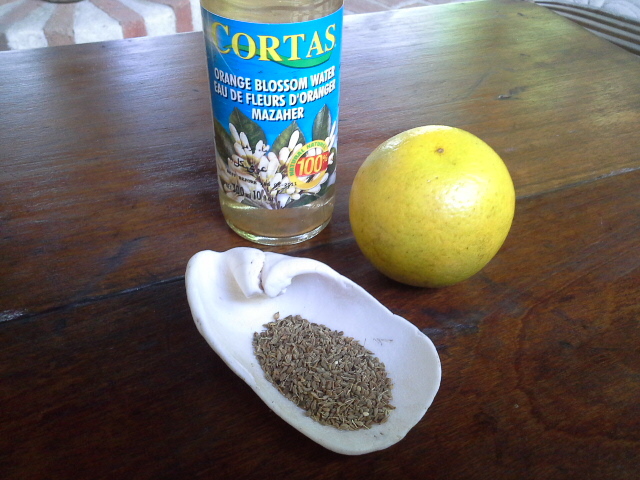 If you don’t have orange blossom water, use grated orange zest instead for a citrusy aroma. In Mexico, orange blossom water is known as agua de naranjo or agua de azahar. Green anise seed was new to me. I’m familiar with star anise used in Asian cooking, but did not know that green anise seed is from a totally different plant. 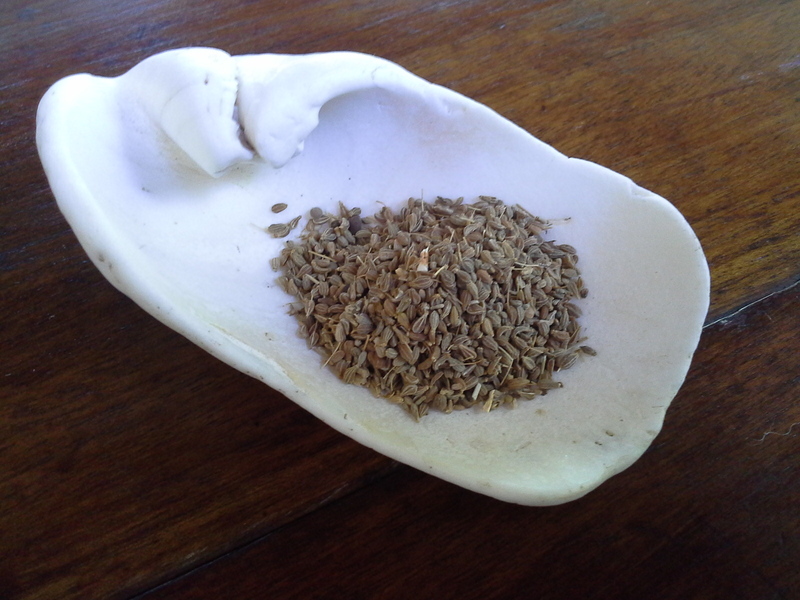 This is the anise used for making absinthe, the green colored liqueur. If you are familiar with my baking by now, you know that I generally use 50% whole wheat flour. To my taste, this adds much to the flavor — a nuttiness and sweetness found only in fresh whole wheat flour. Use all white flour if you prefer, which is in step with most Mexican baked goods. My breads and cakes always have a charming (or embarrassing) homemade look, though this loaf pushed the envelope in the homemade category. When Russell saw my loaf come out of the oven, he kindly said it looked muy rústico. After his first bite, he said it reminded him of his Polish grandma’s babka. In a small saucepan, warm milk, butter and orange zest until butter melts. Remove from heat and discard zest. Whisk in orange blossom water and beaten eggs. Blend yeast, flour, sugar, anise seeds and salt in a large bowl. Gradually add milk mixture, stirring with a large wooden spoon. When the dough becomes too stiff to stir, knead by hand for about 10 minutes until smooth. If too sticky to handle, add flour a tablespoon at a time. If too dry, add water or milk by the tablespoon. Turn into an oiled bowl, cover with plastic wrap, and allow to rise until double in size. Punch down, cover, and refrigerate overnight. The next day, remove dough from refrigerator and bring to cool room temperature. Save aside a small amount of dough to form “bones” and “skull” (sometimes called a tear). Form ball of dough, slightly flattened. Roll 3 small balls of dough into ropes for the “bones”, and shape to form bony segments. Place “bones” across the loaf, with the “skull” or “tear” pressed into the center. Cover with plastic wrap and let rise until almost double in size. Bake in a pre-heated 350 F./180 C. oven for 30-40 minutes, covering with foil in 15 minutes if top browns too quickly. When done, a tap on the bottom of the loaf will make a hollow sound. Or bake until interior temperature measures 190 F/88 C.
Brush with melted butter and sprinkle with sugar. Serve warm. ~ For my readers in Mexico, I have found Espuma de Chapala to be the best whole wheat flour brand in the grocery stores here. It comes in a plastic-lined bag for freshness, and is high in protein, which corresponds to its gluten content, making it great for bread baking. It needs to be kept refrigerated to discourage rancidity, as do all whole grain flours. ~ I used my KitchenAid stand mixer to knead the dough for about 8 minutes. Use your hands, a KitchenAid mixer, or a large enough food processor for mixing and kneading, following dough instructions for mixer or processor. ~ Like other rich egg breads, this bread is best the day it is made. If it lasts longer, toasted slices are almost as good as freshly baked. ~ Thank you to Rachel Laudan for the information about Spanish bakers in Mexico. 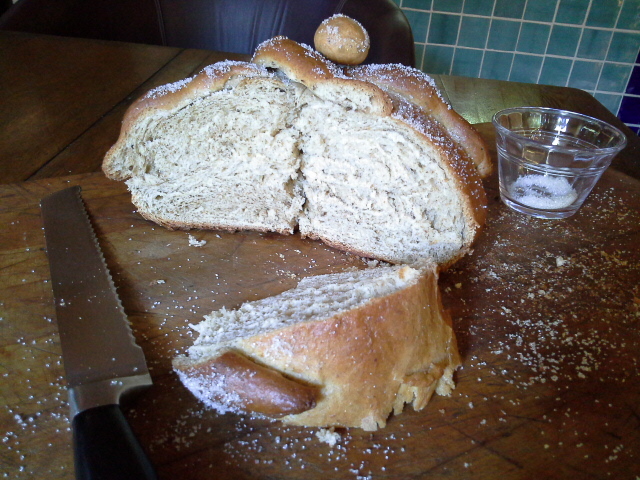 If you are interested in reading more on the history of Pan de Muerto, I recommend her blog, A Historian’s Take on Food and Food Politics. ~ This recipe was primarily adapted from a recipe in Fine Cooking, by Fany Gerson. Other recipes to check are at Pati’s Mexican Table and The Mija Chronicles. Kathleen, that is a beautiful blog. I DONT COOK BUT i appreciate. Sending it to all my foodies. Thank you, Susan. I suspect that many of my readers may not try these recipes, but I hope they will get a glimpse of Mexico and its food culture. Thanks for sharing with your friends. Hi! I just found your email. Thanks, Vicki. I’m glad to be back with my great readers. This recipe sounds better than one I have used in the past. I look forward to trying it. I tried your Tropical Fruit Upside Down Cake recipe for our anniversary and it was delicious! I’ll be using that recipe from now on as a base for pineapple upside down cake ( My husband can’t eat bananas or papaya). I am glad to see you faired okay from the hurricane. I thought about you. I guessed that you evacuated. I hope there was no damage to your place. It is pretty dry where I live in Aguascalientes and I usually end up adding water to my whole wheat recipes. I was glad to see you make your recipes with half whole wheat also. I will be looking for that Espuma Chapala flour. That is good to know. Thank you. I enjoy reading your blog. Hi Angie. We didn’t evacuate. The hurricane made landfall over a hundred miles south of Puerto Vallarta. We got some rain and wind, but not much. Thanks for thinking of me. I am familiar with the Aguascalientes area. We are in an opposite baking climate — I usually need to add flour to a too wet dough, even though I keep flours in the fridge to help keep them dry. I hope you can find the Espuma Chapala flour in Aguascalientes. Thanks for your note. I enjoy hearing from you. Angie referred to this recipe for the Tropical Upside Cake with Pineapple, Banana and Papaya. It could be made with any fruit. I wrote about that recipe in early 2010, and I’m glad to say my photography skills have improved since then. I’ll have to make this cake again and redo the photos for the recipe.